Kubuntu Linux 19.04 DVD (64-Bit) | Linux DVD Shop - UK Linux Shop supplying Linux on CD, DVD and USB with Free UK Delivery, 24Hr Dispatch. Kubuntu Linux 19.04 for 64-bit computers is the latest release of the Linux-based Ubuntu operating system. Kubuntu Linux allows a full install of one of the best and easiest Linux distributions. Kubuntu is a Linux KDE version of one of the most popular Linux distros around, Ubuntu. 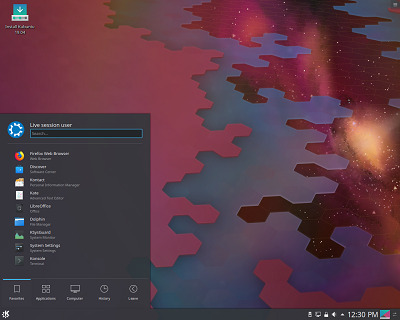 Based on the latest KDE Plasma 5.15 desktop, contains the 5.0.0 Linux Kernel and all the power and features of Debian. Ubuntu is topping the charts as peoples favorite distro and this super KDE version will no doubt be going for that position too in the near future. The Kubuntu project aims to be to KDE what Ubuntu is to Gnome: a great integrated distro with all the great features of Ubuntu, but based on the KDE desktop. Kubuntu includes more than 1,000 pieces of software, starting with Linux version 5.0.0 and KDE Plasma 5.15, and covering every standard desktop application from word processing and spreadsheet applications to internet access applications, web server software, email software, programming languages & tools and of course several games.